Take Heart Premiere's In Melbourne - What a Night! TAKE HEART PREMIERE’S IN MELBOURNE- WHAT A NIGHT! Take Heart Premiere’s in Melbourne – What A Night! On Thursday 10 March, Take Heart made it’s World Premiere at the Australian Center for Moving Image (ACMI). The night began with pre screening function hosted by Take Heart’s Outreach Partner Bupa where the guests were treated to a viewing of the Take Heart photography exhibition. A definite highlight of the evening was hosting Liddywoo Mardi who’s story features in Take Heart and his mother Rosemary who made the journey from the Top End to be with us for the night and participate in media surrounding the Take Heart Premiere. We also had the great pleasure of having Dr Bo Remenyi (Paediatric Cardiologist), Alex Archer (Editor), Adam Starr (Composer), Mike Hill (Director/Producer), Sue Collins (Producer), Hamish Johnston (Multi Media Designer) all in attendance. Many of our fantastic sponsors were also able to be present including Aspen Foundation, RHD Australia, NT Cardiac and the National Heart Foundation who’s support made this project possible. After the pre screening function the guests made their way to the cinema where our MC the wonderful Dr Lyn Roberts AO welcomed the audience and introduced Ron Jones who gave an impassioned Welcome to Country on behalf of the Wurundjeri Land Council. The lights dimmed, the marvelous sounds of Mark Atkins Didgerdoo playing commenced and Stan Grants narration began… the audience we gripped and Take Heart was officially launched. Now the work begins to make the most we can from the opportunity this film Take Heart presents to rid Australasia of Rheumatic Heart Disease. We’ve had a good start in the media and you can read and see all the feature stories from ABC TV, SBS TV, NITV, Radio National, ABC News Radio, ABC News 24, Triple R here. 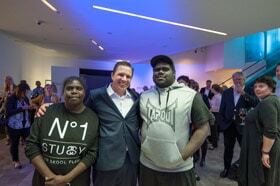 We look forward to sharing more with you as Take Heart heads to the Top End this week ahead of screenings on Closing The Gap day Thursday 17 March followed events on Tiwi Islands including a screening for the community and showing the Photographic Exhibition. If you’d like to see Take Heart please head over to our ‘See It’ page to find out how, or you can purchase a copy to own here. As always- thank you for your support!